If electric power becomes intermittent, water will be a critical resource. A plan for getting water should be top priority. Such a plan may be impossible in the cities. #2 priority is water (#1 priority is shelter if weather is cold). Clean water is essential. One of the single biggest causes of death in areas without medical care, such as third world countries, is diarrhea. According to the WHO, diarrhea causes 4% of all deaths. Diarrhea is the second leading cause of death in children under five years old. It kills over 760,000 children every year. The worst part is that a significant proportion of diarrhea disease can be prevented through safe drinking-water and adequate sanitation. In a world without clean water or food refrigeration, our country could quickly degenerate into a situation not unlike third world countries. Note: Sawyer filters [and many other other brands of filters] will fail if they are frozen after use (wet inside). It will continue to pass water as if it is filtering it, but the ice crystals will have wrecked the microscopic tubes that provide the filtering action. Bacteria will pass through. This is a great filter until a freeze happens. At $19, they are disposable, so they should be crushed after freezing. Sawyer Mini Filter, has a useful life of 100,000 gallons, 0.1 micron filter. Use it with a straw or use it to fill a container. Sawyer Products PointOne Squeeze Water Filtration System. One million gallon capacity. Filter is 0.1 micron. 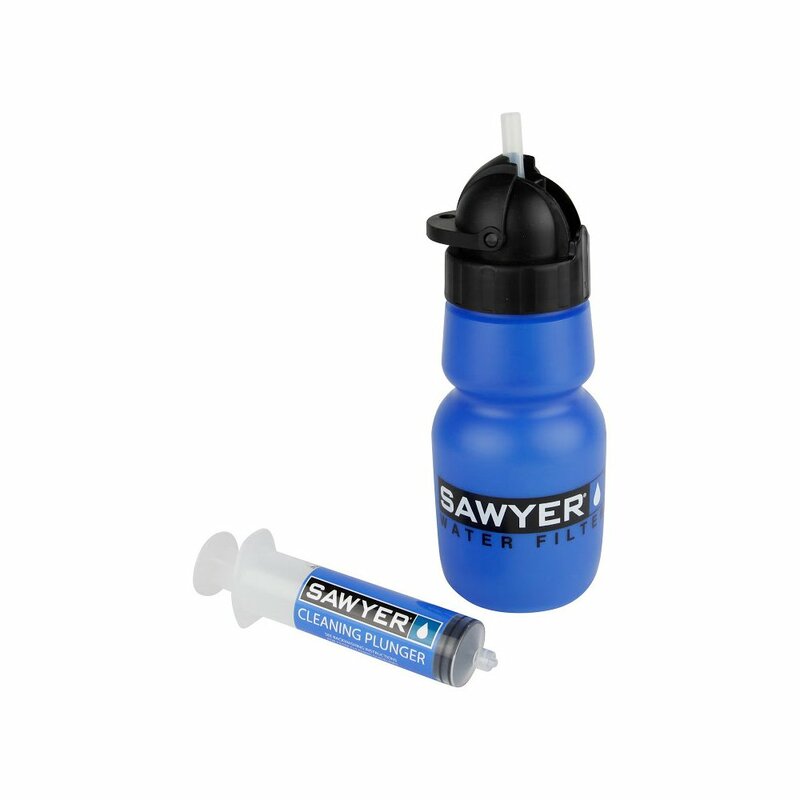 The Sawyer squeeze bottle filter has a lifetime guaranty and life capacity of an amazing 1,000,000 (one million) gallons. Filter size is 0.1 micron. 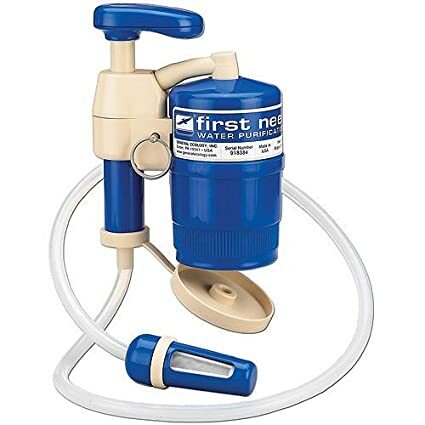 First Need XL Portable Water Purifier, cartridge capacity 125 gallons, flow rate 1.8 quarts/minute. Both a filter and a purifier (kills virus). SteriPEN™ is the only portable water purifier that uses ultraviolet (UV) light to destroy waterborne microbes. It only takes 60 seconds to purify 32 ounces of water. This is a purifier (kills virus), not a filter. Best with clear water. The Katadyn Pocket Filter , with a silver impregnated ceramic element is effective against bacteria and protozoa and can filter up to 0.2 micron. 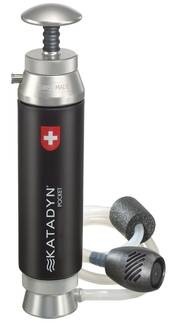 The Katadyn Pocket water filter is the only water filter with a lifetime year warranty. Field-cleanable 0.2 micron ceramic depth filter. Output rate is up to 1 quart/minute. Cartridge Capacity is up to 13,000-gallons, depending on water quality. Requires a separate container to store water. The Big Berkey, can filter 4000 to 6000 gallons of water when using 2 filter elements. The Berkey water filter system removes pathogenic bacteria, parasites and cysts to non detectable levels, removes harmful or unwanted chemicals to below detectable levels, and reduces nitrates, nitrites and unhealthy minerals such as lead and mercury without removing the healthful and nutritional minerals that your body needs. Checkout the Berkey FAQ. Choosing a water filter by Emergency Essentials. Many people believe that you have to boil water to make it safe to drink. In fact, if you heat water to 65° C (149° F), all of the germs that can cause disease in humans are killed. It takes much more fuel to boil water than to heat it to 65° C. To learn more about this, see Water Pasteurization Frequently-Asked Questions. A simple solar water pasteurizer can be made from a soda bottle. A Water Pasteurization Indicator (Video) can be used to measure water temperature to determine when the water is sufficiently hot for pasteurization and safe to drink. Read more about recent advances in water pasteurization. Since water pasteurizes at temperatures well below the boiling point of water, WAPIs save time when solar pasteurizing, and save fuel when using traditional fuels. Or use a solar cooker (solar oven) to pasteurize water. The AquaPak , is a water pasteurizer that uses the WAPI. It has the potential to save thousands of lives and significantly reduce illness among rural populations in nations where access to safe drinking water is scarce.